Jackfruit. What is it you may ask? I know I did when I first saw it on a restaurant menu. Jackfruit is a fruit. One of the largest fruits – up to 80lbs in weight - grown on a tree – a Jackfruit tree. Jackfruit is naturally vegan, dairy-free, gluten-free, also low in calories and an excellent source of fibre. 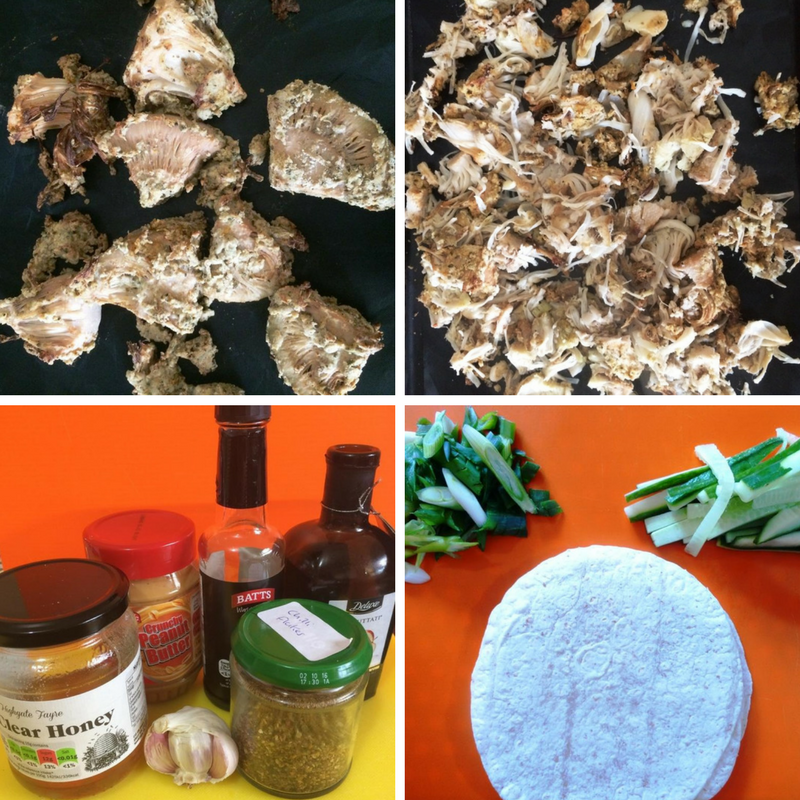 It is also the best vegan ingredient that I have ever seen for making meat-free alternative dishes to burgers, 'pulled-pork' and even more surprisingly Peking Duck! But more than that, it’s also a healthy and sustainable vegan meat replacement. Or as I like to think, a healthy and sustainable meat replacement for anyone – not just vegans and vegetarians. So here is my recipe to make Meat Free Peking ‘Duck’ from Jackfruit. Jackfruit is a good source of protein, potassium, calcium, and iron. Traditionally as a starchy unripe fruit, it is cooked in curries, while sweet, ripe jackfruit complements sticky rice and ice cream. But now it is growing in other uses too. It can become vegan ‘pulled-pork’ and vegan ‘Peking duck’. Being a fruit, jackfruit isn’t high in protein but is considered a meat alternative for the meaty texture that it provides, which comes from its density and heartiness. I’d discovered the delights of Jackfruit at The Bohemian Restaurant on Pink Lane in Newcastle. We’d tried the Shredded Peking Jackfruit with Hoisin Sauce, pancakes, cucumber and spring onion and couldn’t believe how good it was. My hubby who had previously been a big fan of crispy duck was very impressed. I’ve never tried crispy duck but the jackfruit version was delicious. So delicious that I decided to try and make it at home. In some parts of the world, Jackfruit is an everyday food, especially in south and south-east Asia. However here is the UK it is much less well-known. I was only able to buy tins of Jackfruit in a specialist vegan store in Newcastle, not a mainstream supermarket. 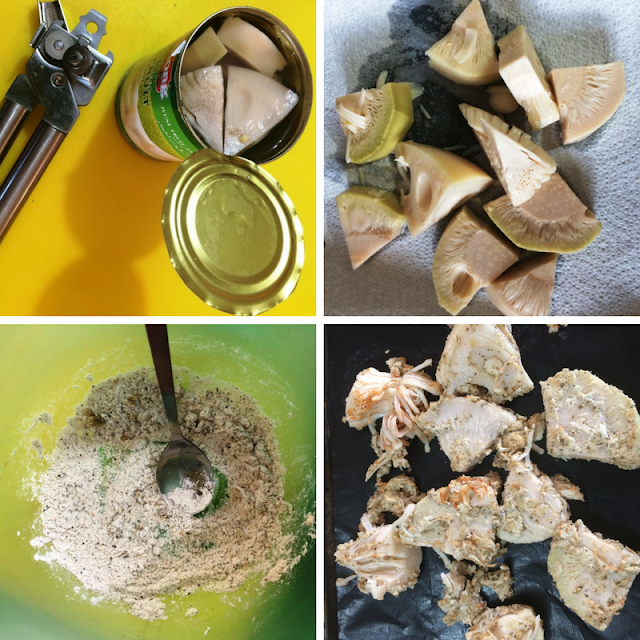 Much like any starchy food, the secret to cooking jackfruit is all about adding flavour. 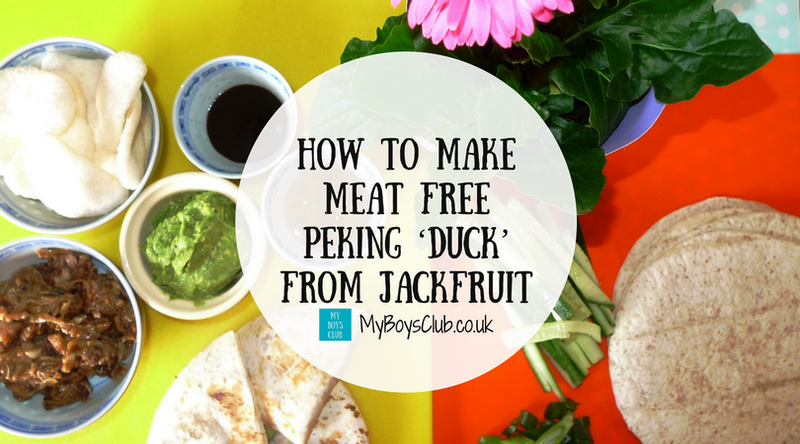 So here are the ingredients you will need to make my Jackfruit Recipe for Peking Duck, and step by step instructions which are easy to follow. 2. Drain, rinse and dry the Jackfruit, coat in the Chinese 5 spice and flour. 5. Gently fry the garlic, ginger, chilli in a pan then add the cooked Jackfruit. 6. Mix the peanut butter, soy, vinegar and honey then add to the pan. 7. Stir until the sauce becomes sticky. 9. Slice the spring onions and cucumber into matchsticks and serve with pancakes and dipping sauces of your choice. Place the jackfruit, cucumber and spring onion on a pancake, drizzle with your favourite dipping sauce, roll and eat. We enjoyed a lovely lunch of Peking Duck accompanied by Mushroom Quesadillas with homemade guacamole. Jackfruit is an amazing discovery for us. I now want to try it in more dishes to see if it’s as good as Peking Duck! What discoveries have you made with new foods? Thanks - you'll have to give it a go. Wow, it really is often I come across something I've never heard of! This sounds so intriguing! Mind you, I've never had Peking duck in it's meaty form! Sounds and looks delicious! This looks amazing! I haven't heard of jackfruit but am always looking for interesting vegetarian and wheat free alternatives. Thanks! I love the sound of this recipe. Going to try it. 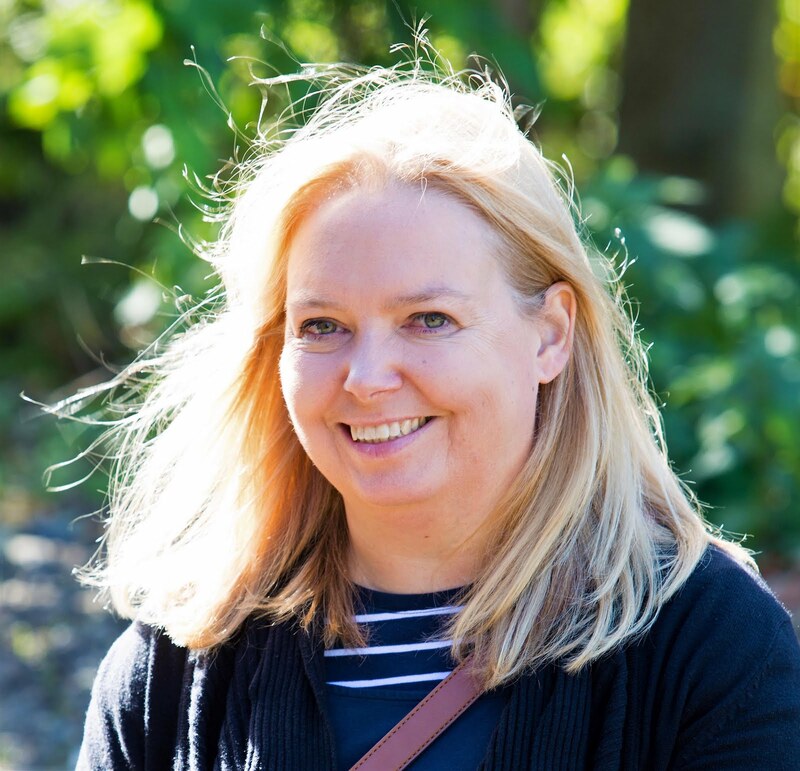 Yay - let me know what you think! There is jackfruit available in can???!!! Oh first time I heard it coz we do have fresh and real jackfruits! Wow sounds good! I have never heard of jack fruit before it looks interesting. I have never heard of Jackfruit before. Seriously 80lbs! That is crazy! I will be honest none of this looks appetizing to me but I am a very plain eater as my mom puts it. I am however interested in learning more about this Jackfruit! Never heard of this fruit, thanks for sharing your information and your recipes, will have to look for it here in FLorida. Do you need to cut the edge off of the jackfruit? I believe the edge's texture is harder. This looks really good! I wonder if the Jackfruit is available in USA? will check on amazon too!